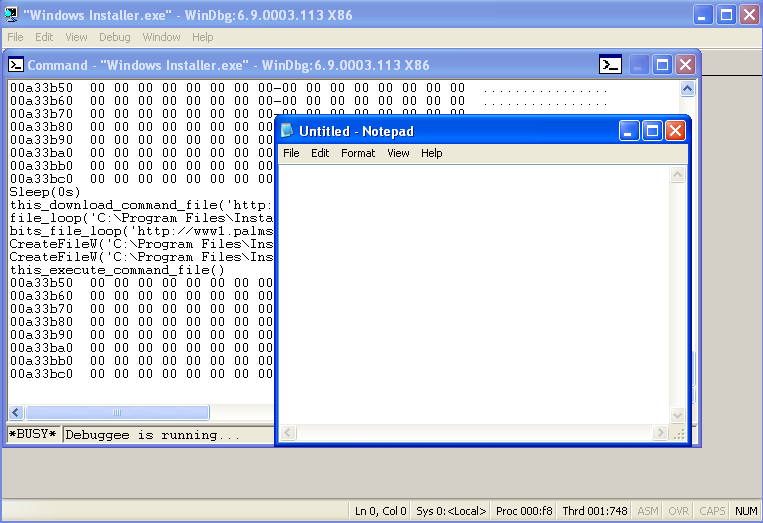 A strange executable, named MSMSGS.EXE, was found on several machines on the network of a customer, apparently dropped by the exploitation of a vulnerability inside Word files. As monitoring tools (registry/file/socket) provided insufficient information on the malware's behaviour, we proceeded with a complete analysis. First, let's load the file inside the IDA Pro disassembler. IDA Pro, which was developed and published by DataRescue for several years, remains the best tool for the low-level analysis of malware. Here's what the disassembly looks like. .text:00402A72 mov [eax], ecx ; segmentation fault ! The program tries to register as a fake 'Logical Disk Manager Service' system service or as a 'Windows Media Player' application in the registry startup keys, then it copies itself to the 'Application Data' directory, adjust its date to match the one of the first DLL file found in the Windows directory, and finally starts itself again from this new working directory. If it was already present in the 'Application Data' directory, then the run function executes instead, which basically extracts a payload from its data section and writes it to a new file, 'C:\Program Files\WindowsUpdate\Windows Installer.exe', itself executed. www1.palms-us.org       canonical name = fakeuser.w114.west263.cn. .text:00403ED1 push offset aWorkfunc ; "workFunc"
It is interesting to note that some needed APIs (like CreateWaitableTimer) are imported by manually parsing KERNEL32.DLL's export table and looking for corresponding CRC, a really old technique commonly used in viruses. However, only the BITS related code is importing its required APIs using this trick, which tends to demonstrate the backdoor's author most probably cut and pasted this code snippet. (C) Copyright 2000-2004 Microsoft Corp.
JOB FILES: 0 / UNKNOWN WORKING http://www1.palms-us.org/ld/v2/loginv2.asp? but it does not have the correct associated data being resolved for. JOB FILES: 0 / UNKNOWN WORKING http://www1.palms-us.org/ld/v2/votev2.asp? For example, our captured string with the 'n4' command causes the backdoor to sleep for 300 seconds, then try to get a new command again. So actually, the backdoor seems to be dormant, waiting most probably until a command to execute a given process appears on the master host. Remark that the run_process*() and run_thread*() functions all depend on the previously described bits_file_loop() function, which they use to download an executable or a DLL. This downloaded file is then verified against a given MD5 (which was passsed as an argument to the command), and finally gets executed, either as a stand-alone process or as a new thread inside the current process. bp kernel32!CreateFileA ".printf \"CreateFileA('%ma')\\n\", poi(esp+4) ; gc"
bp kernel32!CreateFileW ".printf \"CreateFileW('%mu')\\n\", poi(esp+4) ; gc"
bp kernel32!CreateWaitableTimerW ".printf \"CreateWaitableTimerW('%mu')\\n\", poi(esp+3*4) ; gc"
bp kernel32!GetTickCount "$$ .printf \"GetTickCount()\\n\" ; r eax = 0 ; r eip = poi(esp) ; r esp = esp + 4 ; gc"
bp kernel32!LoadLibraryW ".printf \"LoadLibraryW('%mu')\\n\", poi(esp+4) ; gc"
bp kernel32!Sleep ".printf \"Sleep(%ds)\\n\", poi(esp+4)/0n1000 ; gc"
bp wininet!InternetOpenA "$$ .printf \"InternetOpenA()\\n\" ; r eax = 0xDEADBEEF ; r eip = poi(esp) ; r esp = esp + 6*4 ; gc"
bu drmv021!workFunc ".printf \"workFunc('%ma', '%ma', '%ma')\\n\", poi(esp+4), poi(esp+2*4), poi(esp+3*4)"
bp 0x10002D20 ".printf \"this_download_command_file('%mu')\\n\", poi(esp+4) ; gc"
bp 0x10002AA0 ".printf \"file_loop('%mu', %d)\\n\", poi(esp+3*4), poi(esp+4*4) ; gc"
r esp = esp + 4 ; gc"
bp 0x10001000 "r @$t0 = poi(esp+2*4) ; g @$ra ; .printf \"%y: get_proc_by_checksum('%y') = '%y'\\n\", eip, @$t0, eax+5 ; gc"
bp 0x10003B30 ".printf \"this_execute_command_file()\\n\" ; db poi(ecx+0xC) ; gc"
It confirms the creation of the DRMV021.LIC DLL, which is then loaded, and its workFunc() function executed. The backdoor then requests a first command, which we returns from our faked command file '0'. This command is successfully passed for execution, and finally the CreateProcess() API causes a Notepad window to popup as requested! We successfully determined that the backdoor's main purpose is to communicate with a master host to receive commands, and proved that the attacker can use it to fully control a compromised machine. The layout of the code suggests us that the backdoor contains code snippets coming from various external sources, and that the autor is not really skilled. As a final note, both executables are now detected by our antivirus solution, but the embedded DLL (containing the core communication engine, which basically could be reused easily) was not.